This Veterans Day We Recognize the Battles Fought at Home | Hupy and Abraham, S.C.
At Hupy and Abraham, our mission to support our communities has allowed us to encounter some very important groups and organizations. But for all we do, it pales in comparison to the sacrifices and service of our veterans. This Veterans Day, we think it is important to recognize some of the causes that we believe most benefit our veterans and active service members. Last summer, Hupy and Abraham had the honor of supporting the Project 22 Ride, Film & Resource Event developed by the UWM Military and Veteran Resource Center. As many veterans return from active duty and attempt to return to their normal lives, many suffer from PTSD (post-traumatic stress disorder) and traumatic brain injuries, which can devastate social lives, personal relationships and mental health. “Project 22” is a documentary film detailing the story of two veterans, Doc King and Daniel Egbert, who launched a 22-day, 6,500-mile, cross-country mission to raise awareness of the high rate of suicide among veterans. Before the screening of the film, Project 22 organized a 22-mile ride to further raise awareness of the film and the important issue it sought to spotlight. Initiatives like Project 22 play an integral part in changing the way we as a society recognize the many different kinds of battles fought by veterans every day. In the past, Hupy and Abraham has participated in the State Bar of Wisconsin’s “Wills for Veterans” program in which attorneys and paralegals help Wisconsin veterans and their families prepare wills, powers of attorney and finances. In 2015, we also sponsored the Veterans Law Center in Madison, a free walk-in legal clinic that serves low-income veterans and their families, as well as the Midwest Shelter for Homeless Veterans. Services such as these help support veterans who are so often underserved. 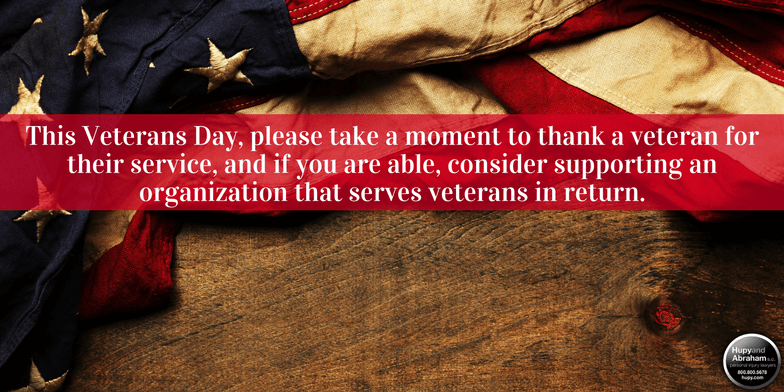 This Veterans Day, please take a moment to thank a veteran for their service, and if you are able, consider supporting an organization that serves veterans in return. All of us at Hupy and Abraham extend our deepest thanks to all veterans and active members of the military for their continued service.